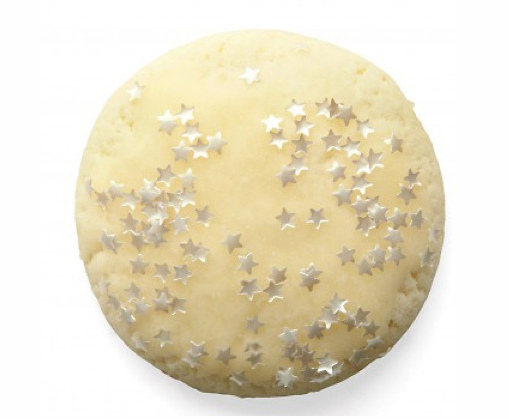 The star-shaped edible glitter (Michaels.com) is an optional embellishment for these lemon cookies. The topping really makes them sparkle, but you could also use coarse sanding sugar or simply leave the cookies glazed. Preheat oven to 325-degrees. Whisk together flour and ¼ teaspoon salt in a small bowl. Beat butter, granulated sugar, and lemon zest with a mixer on medium speed until pale and fluffy, about 10 minutes. Beat in eggs. Reduce speed to low, and gradually beat in flour mixture. Slowly add milk, and beat on medium speed for 5 minutes. Transfer dough to a pastry bag fitted with a ½- inch plain round trip. Pipe 1 ½- inch rounds onto parchment-lined baking sheets. Bake until bottoms are pale gold, 16 to 18 minutes. Let cool completely on sheets set on wire racks. Whisk together confectioners' sugar and lemon juice in a small bowl until smooth. Brush glaze onto cookies, and sprinkle with edible glitter.